Hunting lease rate: $5,850/year - LEASED! This is one amazing hunting property with many diverse habitat types and terrain changes. Large and beautiful Grindstone Creek is a defining feature of the property, passing through its entire length and providing a year round water source to wildlife. 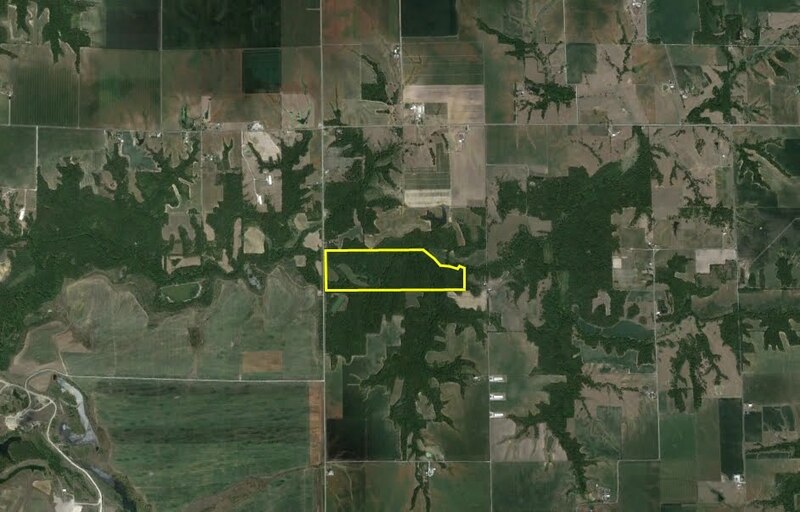 The property is loaded with upland timber, bottomland timber, 10 acres of tillable acreage and a number of small wetlands adjacent to Grindstone Creek. The tillable acreage is planted in row crops by a local farmer and provide a great food source to deer, not to mention the numerous agricultural fields that adjoin the property. There are numerous pictures, aerial maps and a photo album below which will help familiarize you with this outstanding property. If you have any questions about Grindstone Creek Farm or if you would like to schedule a visit to take a look at it, please fill out the incredibly easy to use form at the bottom of this page or email us at manderson@teraprom.com. The aerial image below shows the boundaries of the property as well as Grindstone Creek and a smaller tributary. As you can see in the regional map below, the property is extremely well situated, connected to large blocks of habitat and proximity to agricultural fields in all directions. We have never seen more deer trails and deer sign on a property as there is on this one! The property has received very little hunting pressure in the past and this is the first year that it is being leased for hunting! Be sure to lock this property up soon because after it gets leased, we don't expect it to be available again for many years! Below is a selection of the deer sign that literally covers this property! This property is loaded with water features, most notably Grindstone Creek, which is a large tributary to the La Moine River. Grindstone Creek is approximately 30-40 feet wide and runs year-round. It winds all the way through the property from east to west. A smaller creek enters the property from the south and joins Grindstone Creek just north of the property line. These creeks can be seen in the aerial photo above. In addition, there are a number of wetlands in the creek bottom adjacent to Grindstone Creek which provide excellent wildlife habitat and great scenic diversity. The creek bottom is flanked by gentle hills with upland habitats (oak-hickory trees) on both sides with excellent perspectives of the creek bottom below. These hills also serve as a refuge for wildlife during periods of high water when the bottom is flooded. Grindstone Creek is crossable on foot (though it may be deeper than your boots! ), or by ATVs when water conditions are normal (but not during high water). Great access off of a paved highway, which will soon be gravelled! And hills with excellent perspectives! Don't miss this web album below which contains nearly 100 recent pictures of the property! This lease covers all deer and turkey hunting seasons. The property will be leased on a first-come, first-served basis. A 10% non-refundable deposit is required to secure the lease. The remaining balance can be paid in a lump sum or spread across multiple payments--we will work with you to arrange a payment schedule that meets your needs. Please note however that failure to make a payment by the deadlines specified in the lease will result in a default of the lease and forfeiture of any money already paid. The lease term will begin immediately upon lease signing and run until May 31, 2014. A multi-year lease of up to 3 years in length with a 5% annual price increase is available if you would like to secure the property beyond the 2013-14 hunting season.